so you can cover the front of a shirt. There are three themes in this collection. The first being Musical Instruments. It features musical instruments with holly details and some elements of the well known carol, The Twelve Days of Christmas. The second theme is called Angels. In this theme there are two jumbo angels with holly leaves and lowers to help create a beautiful garment. The other set is Nativity. It features the three wise men and baby Jesus in his manger with great detail. 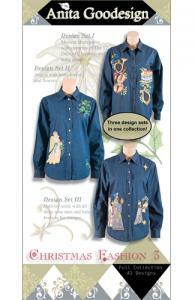 This collection is a must have if you want to create festive garment for the holidays!